This tutorial is intended to help non-coders make crater detections using Michael Klear's PyCDA. For more advanced python users, check out the official documentation and/or this demo notebook. 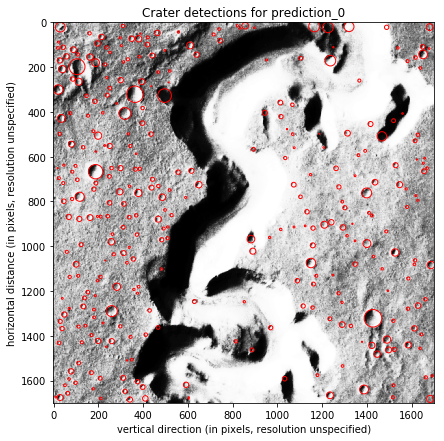 By following the steps in this tutorial, you can make crater detections on your very own computer! If you're new to Python altogether, the fastest way to get started (and the approach we’ll take in this tutorial) is by installing Conda on your computer. The recommended version of conda for this tutorial is Anaconda. Anaconda comes with python and a lot of extra features. Go to this page, select your operating system, and download the Python 3.6 version. Follow the steps to install Anaconda on your system; for additional help with getting up and running with Anaconda, check out this great tutorial for installing Anaconda on Windows or this tutorial for installing Anaconda on MacOS. If this works, you've successfully installed PyCDA! You should see some output in the console; if you've never run a notebook before, you may need to copy and paste the link that appears. Otherwise, it should automatically open a tab in your browser. From the Jupyter menu, click on the tab on the upper-right corner called "new" and select "Python 3" from the drop-down menu. This will open up a new notebook. 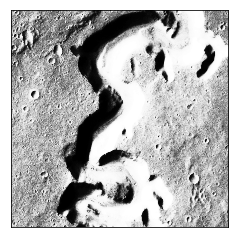 For this demonstration, we'll be using the default sample image, holdout_tile.pgm. To load it, use the following code. This will also display the image. This assigns the image to the python object named "image" and displays it in your notebook. 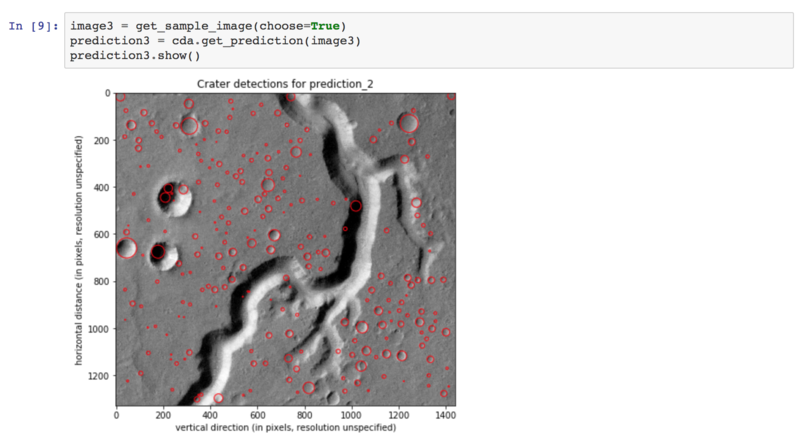 Next, create a crater detection pipeline. 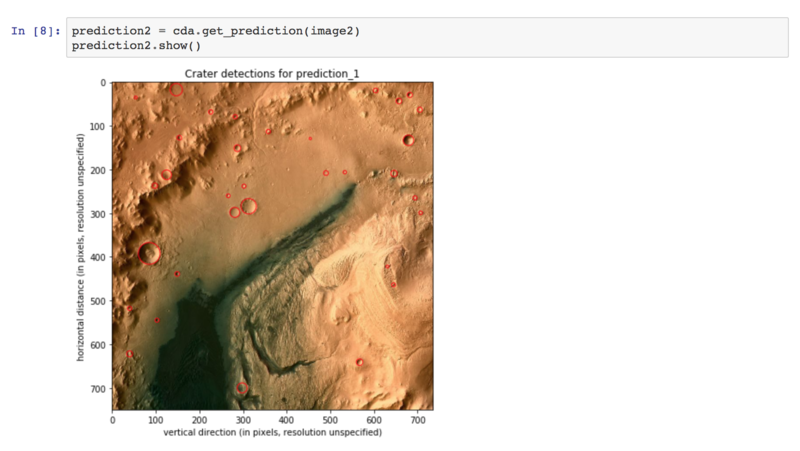 This command loads the crater detection models, so it may take a few moments to execute. Ignore any warnings; these are harmless outputs from the Keras package, which runs in the background to make detections. These dimensions are in number of pixels from the image's origin, which is the upper lefthand corner of the image; so, a crater at 'lat' 16 and 'long' 310 with diameter 14.8 is centered at 16 pixels from the top of the image and 310 pixels from the left edge of the image with a diameter of 14.8 pixels. Use the resolution of the image to convert these values to meters. This feature simply overlays the information from the list of detection onto the input image so you can see how the predictions look. For more features, check out the demo notebook and the official PyCDA documentation! The program is not perfect; in particular, it struggles with lighting conditions not found in the training data and craters that are larger than those found in the training data. These are known problems documented by crater detection research projects, but ongoing work is promising for improving performance in these areas. PyCDA's mission is to keep up with the latest advances in this technology and to make them accessible to all; keep a look out for future updates and improved models!